I am wanting to put a distributor on a 4.6 block which has a 4.6 Crankshaft and 4.6 Camshaft. 1. I assume a cam shaft with a dissy drive is required. I did hear somewhere that there is an adaptor that can go in but I have only heard of that once and assume this is not the case and a new camshaft is needed. 2. The 4.6 crankshaft has a shorter front end than a 3.9/3.5 crankshaft and I understand an adaptor is needed so the crank pulley can bolt up with the thicker timing cover. Does anyone have dimensions of this adaptor? or where they can be purchased. 3. Other than the camshaft and crankshaft extension, are there any other issues to be considered? Is there a necessity for a dizzy ? Modern crank based ignition is easy to do. I suppose you are thinking megajolt and trigger wheels etc - not keen on these as there is no expertise locally. If you have other off the shelf options I would be glad to consider those - I already have the timing cover, dissy and cam just not the crankshaft spacer. What vehicle is it for? Can't you use the GEMS/Thor flywheel or auto drive plate with it's built in trigger setup and the OEM engine ECU? The engine is a Landrover 101 - it has a 3.5 manual flywheel. It is a project not running. It currently has a trigger wheel, Edis 8 (in default) and coil packs - it has virtually no spark and cylinders 1 and 6 (wasted spark pair) have no spark at all - not the spark plugs as they are new and work fine, the leads are OK - the issue is in the trigger wheel (not sure I have that right), the sensor, edis 8 module or the coil packs. I am currently pulling it all back out and rewiring it to see if that is an issue - unfortunately I am not familiar with this kit where I am with dissys etc and there is no local expertise on megasquirt and megajolt in my area. Other than the wiring I do not know how to test the Edis module or the coil packs. Unless the Motronics ECU is heavily modified they do not work in isolation from the donor vehicle . If the trigger wheel and sensor are already fitted (correctly) the difficult bit is done. To check this, turn the engine to TDC. The sensor should line up on the 5th tooth anti clockwise (looking at the front of the engine) from the missing one. Set the sensor gap to 1mm and check it is +/- 0.5mm on other teeth (say every 9th tooth) to check the wheel is centred. 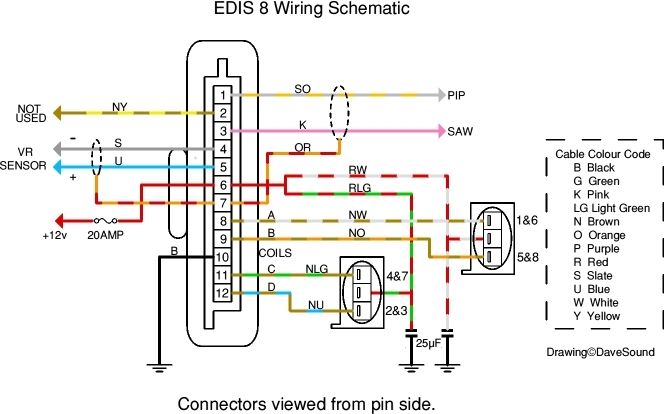 Here's my drawing of the EDIS 8 schematic. If it's not too good as a JPG, PM me with your email and I'll send a PDF which is much better quality. Generally EDIS is pretty reliable and long lasting. You may have to try swapping the sensor connections if you still don't get a decent spark, and everything else is OK. Thanks Dave - I already have those diagrams. One possible issue is that I cannot get the sensor closer than 2mm from the trigger teeth. Originally I could not get it closer than 5mm with the standard mounting brackets bolted to the correct holes on the engine block. I have I have modified the standard mounting by elongating the holes and got to 2mm. As well as checking the wiring tomorrow I will re-calibrate the trigger wheel and the sensor - unfortunately the engine never had TDC marks and I calculated where it should be using one of the recommended methods but maybe the TDC mark I determined is not totally correct but should be within 5 degrees. I've not experimented with the sensor gap, but the spec I have is from 0.5 - 1.5mm (0.030-0.060") So generally just set it to 1mm, and check it is OK on other teeth. If you still have trouble getting a reliable spark, try swapping the VR polarity. Lots on the MS forum will say not to use EDIS. Starting with a clean sheet, I'd likely not either. But since you already have it, no reason why it won't be fine on a low revving unit like the 4.6. It's worked just fine on my Vitesse engine for many a year - although since I have the MS upgrade bug, I'm going to go MS3 and sequential everything using active coils, when I fit my new engine. If going for a blower, wasted spark may not be ideal, though. FWIW, I don't know of anyone who has fitted MS to a Thor manifold. Likely because the Bosch system works just fine - unlike the earlier Lucas. But can't see any problems in doing so - I've got a complete Thor manifold etc here. And it has better idle control than the earlier systems. So is has a weak spark on all but cyl 1 and 6? What ECU is triggering the EDIS module? There really isnt anything on a basic crank based ignition setup that needs any expertise. It should be very easy for most anyone to get it up and running, especially the likes of megajolt etc. If budget permitted, then there are Aussie based makers of various ecu's where local support should be easy, but there shouldnt be any real need to go that far if indeed you just purely want ignition control. Although it's pretty much for DIY electronics types, the Speeduino project is interesting, and has an Oz following. And is very low cost, being based on the Arduino. Not sure if it could be used with EDIS for ignition only, but would guess it could. EDIS is a (nearly) stand alone system. It will produced a fixed timed spark (10 BTDC, as a limp home feature) with no external ECU. The EDIS module sends a tach signal (PIP) to the ECU, and the ECU then sends back a control signal (SAW) to the EDIS module which does the timing advance. This simplicity is why it is (was) so popular for non OEM use, as it decodes the crank trigger into a simple pulse to send to the ECU - often what trips people up with MS, etc. It's also pretty bomb proof. It has no spark on cyl 1 and 6 and weak spark on the rest. EDIS is operating in default mode so no ECU is attached. Yes, Thanks Dave for making my point clearer - I understand this, I was referring (maybe to simply) to control signal when I mentioned about the ECU trigger. So currently this install would be just running a fixed 10deg advance. - Countersink one of the crossbolts and fit the same type of crossbolt as that found by the starter. - Fit a spacer ring over the crankshaft nose after fitting the pulley as it's longer.